Sad! The uniform has been so far removed from the pride and tradition aspect of the Air Force. 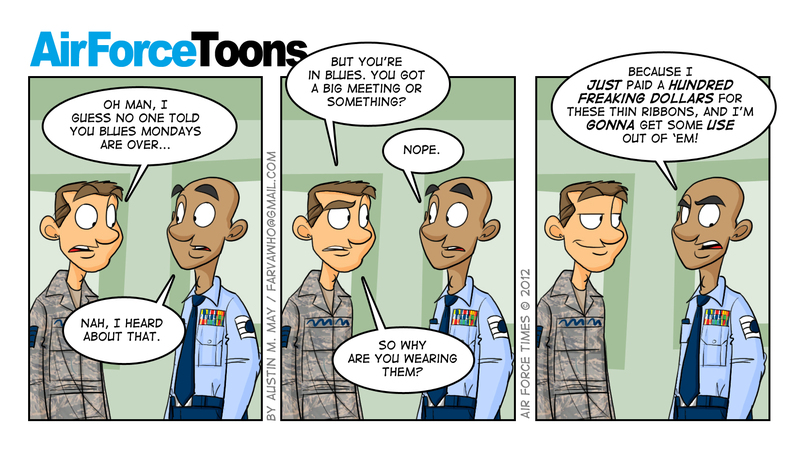 So many modern day Airmen view it as more of an inconvenience than an integral part of their profession. And the saddest part of that is that that mindset isn’t limited to first term airmen. FAR too often comments are sent in to the Air Force Times questioning the relevance of the uniform and uniform elements by Staff, Technical and Master Sergeants. If showing pride in your uniform is too off putting to these Non-commissioned Officers, I’m certain that McDonalds is hiring! Of course the uniform has been ‘removed from the pride and tradition’ aspect. When the only uniform that is kept around without changes is uncomfortable, pointless, and looks horrible–even when worn correctly–why would we be proud of it? When the USAF is able to spend millions to develop a ‘battle’ uniform that is rather quickly ruled to be inappropriate for a combat zone, and seems to view uniforms as just another way to ‘leave a mark’, it has an effect on everyone who wears it.